Judy Zimet, DIMC Co-Founder, is pictured with Phoenix. 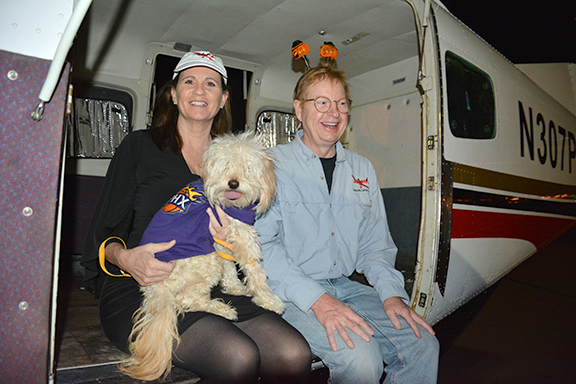 Dog Is My CoPilot (DIMC) flew their 8,000th passenger along with over 50 other dogs from Maricopa County Animal Care & Control (MCACC) in Arizona to shelters in Montana. Shelters like MCACC are overflowing with animals and not enough adopters so transporting them gives them a chance at finding their forever home through organizations that have adopters waiting! DIMC will began the day by loading the animals into their Cessna 208B at 5:30 a.m. Once the animals were loaded, they took off to Montana to be received by the Humane Society of Western Montana, Thompson Falls Animal Care and Control, and All Hearts Rescue. In the last five years, DIMC has experienced great success in saving a few hundred dogs and cats to rescuing over 2,500 in the past year alone. In total, after the flight on Oct. 31, they will have been able to rescue over 8,000 animals. To help them in their mission to save animals from euthanasia, help donate to their website https://dogcopilot.org/donate-now/.